When my mother-in-law informed me that my courier had arrived I had no recollection of what I had ordered. The package sat snugly on the TV stand and I looked at it curiously. I walked closer and then it hit me. I did not have to open the package to know what it was. The package was emitting a beautiful citrus smell and soon the room was filled with it. The Ambi Pur sample that I had ordered on Indiblogger had finally arrived. I thought my order might somewhere get lost amongst the thousand people vying for a free sample. But hats off to Ambi Pur and Indiblogger for their efficiency. The package was neat and elegant and the sample smelt like a slice of heaven. The orange color was pleasing to the eye too. So I immediately went to our car and pulled out the almost empty Ambi Pur (Oh yeah, we are Ambi Pur loyalists) and plugged in the new one. I was used to the same old lavender smell, but the light citrus one was fresh and bursting with energy. All I wanted to do was put on some music and go on a long road trip. As so the impromptu trip was decided. Me, the husband and our faithful Maruthi Suzuki Alto. And the destination? Our love nest, GOA. Goa was one of the many places we had visited together before we got married. It was magical and from then on Goa remains the most special place to us. We even made it our honeymoon destination. So when we completed three successful months of being married, we decided to celebrate and pay our dear old friend Goa a visit. Only this time it was a road trip. The first road trip I had taken to Pondicherry was a disaster. Bad companions, bad car and no Ambi Pur. There were a lot of people smoking in the car and the air freshener was hardly of any help. I had sworn away from road trips since then. But when my husband mentioned the idea of a road trip to Goa, I had to give in. The place I love with the man I love. Can there be a better combo? We had about 560 kms ahead of us. The planned route was via Tumkur to Davangere. Then via Hubli to Karwar and then Margao to Calangute. We had booked a room for us at 'Village Royale', Calangute, and we couldn't wait to get there. Cal, my husband started the drive as we wanted to get out off the city limits by about 8 am. Bangalore is a late riser and people only fill the streets by 9 am. We wanted to use this to our advantage. I'm a late riser myself, but this I was enjoying. 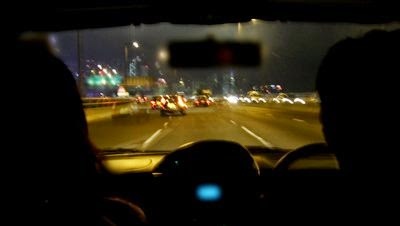 I rested my head on his shoulder as he drove and 'Stereo hearts' played along creating a wonderful effect. This was heaven. Right here in front of my eyes. With a beginning this perfect I knew that this would be a trip to remember. There is a stretch on the way to Tumkur that stinks like a herd of animal carcasses. I cringed as we approached it, but surprisingly felt none of that stench. My window is always pulled down as the AC in a vehicle gives me a royal headache and I pass out. Cal was not the one to take such chances. He pulled down our windows and cleared the stinky stretch in one go. All I could feel was the beautiful orange emission and nothing else. Just like they show in the ads I could feel a cloud of orange beads enveloping me to prevent me from the smell. Awesome job Ambi Pur. My husband smiled as this was the first time I had not complained about this stretch and sat quietly. We spoke of the last time we had passed this place by bus and laughed out loud. After making a mental note to only buy Ambi Pur from next time, we continued our journey and we were in Davangere by 10.30 am. The foodie in me was wide awake by now and I was craving the special Davangere dosa. The toast we had as breakfast was digested long ago and we walked into a street side small hotel. The butter dosa was crisp and fantastic and soon Cal was ordering himself another. After two cups of filter coffee each, it was time to head to Hubli. This also meant that it was my turn to drive. After buckling myself, I started driving. I had never driven long distances before so this was another first that I was enjoying. 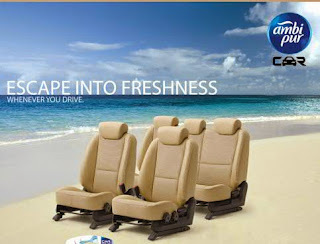 Cal joked about me crashing both of us somewhere, but I told him that the fresh smell inside the car thanks to Ambi Pur was enough to keep me awake all day. We skipped the music this time and decided to play antakshari instead. I always knew that my husband had an awesome voice but he kept surprising me with one song after another. Me as usual sounded like a frog suffering from laryngitis. But watching him enjoy my songs made me forget all of it and he even grooved to some of it. We laughed and sang all the way and before the clock could strike one, we were at Hubli. Thanks to multiple dosas we weren't hungry for lunch but I changed my mind when I saw a road side vendor selling some fried fish. For some reason the car automatically stopped in front of it. Don't believe me? Cal didn't either. And so I sent my Brahmin husband to buy some fried Ghee fish, my favorite. I wanted to stand right there and eat but thanks to a few local hooligans Cal sent me back to the car. He drove as I devoured the fish and smeared it all over my face. He laughed at me. I looked back at him and said "What are you laughing at? Aren't you allergic to the smell of fish?". He suddenly looked all surprised. He had not realized it! I was shocked. There was no merging of smells and the car still smelt fresh just like how it was at the start of our journey. Ambi Pur only kept impressing us more and more. Talking about our dating days we continued to drive towards Karwar. On the way we stopped to fill fuel, relieved ourselves and continued our journey. The target was to reach Karwar by 4 pm but by the time we got there it was about 5 pm, thanks to the bad roads. At least we were spared from the stench and the headache that follows it. I was glad. We stopped and had some bhajjis and coffee at a road side push cart. I don't know why people make a face when asked to eat from the roadside. The food usually here is tasty and cleanly made. And not to mention it is very cheap. Cal and me have made no bones about eating at road side stalls. We enjoy the food here just as we would in any other big starred restaurant. We were a little tired from all the driving and hence decided to rest for a while in the car itself. We sat talking non-stop and enjoyed every minute of it. Usually confined environments make me feel claustrophobic but Ambi Pur did not let that be. We sat there lost in our past memories. Only when we heard the clock beep at six, we realized that we had to leave. I took the drivers seat this time and headed towards Margao which was an hour and half away. I asked Cal to rest for a while and I drove listening to faint music. It was bliss and somehow at that time I felt a sense of freedom. Looking at Cal curled up in the seat beside me only widened my smile. This, this was my perfect life. Cal awoke as we reached Margao. The humidity hit us and soon we were sweating. Goa, we were here. We stopped for some juice and then Cal took the drivers seat and headed towards Calangute. We reached our hotel by 9 pm and walked into our room with a big smile. 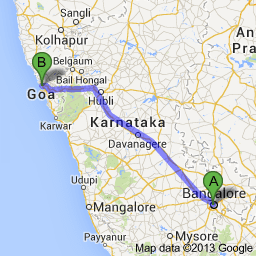 It normally takes about 10 to 11 hours from Bangalore to Goa, but thanks to our million pit-stops it took us 15 hours. No regrets. We still felt fresh albeit a bit tired. But it was the most amazing trip ever. The journey was filled with the freshness of Ambi Pur and our love. How could it not be a perfect road trip? 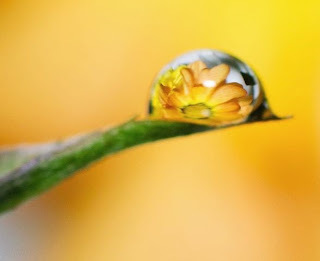 This post is written as part of the 'The perfect road trip contest' on Indiblogger. Presented by Ambi Pur. Check out the Ambi Pur Facebook page here. Best wishes for the contest, Sowmya. To each his/her own. Such communities give you topics to write about which otherwise you never will. Its a challenge. Hahaha, I have no idea too. Just wrote what I felt was right and the truth.